Sierra Trading Post was founded in 1986 in Reno, NV. The company originally operated as a catalog retailer, but in December 1998 decided to expand their business online when they launched SierraTradingPost.com. In December 2012 Sierra Trading Post was purchased by TJX Companies which operates popular stores like T.J. Maxx, HomeGoods and Marshalls. 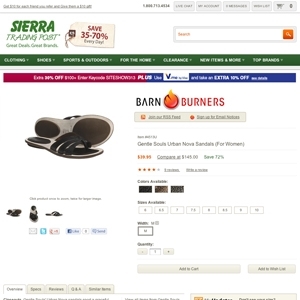 The Sierra Trading Post Barn Burners deal offers one deal a day on items that can range from clothing; shoes; outdoor gear; sporting goods; things for the home such as electronics, furnishings, beddings and more. Sierratradingpost.com currently ranks #25 amongst sites offering online deals -- Rue La La ranks #24. In the General Merchandise category, Sierra Trading Post ranks at #17 -- Ruelala.com again ranks slightly higher at #16.